Schematic representation of general transaction model. (a) Emitter E sends out "offer wave" in both time directions. and sending "confirmation wave" echo back to emitter. John Cramer published The Transactional Interpretation (TI) of Quantum Mechanics in July 1986. This interpretation contains quantum mechanical waves moving both forward and backward in time. 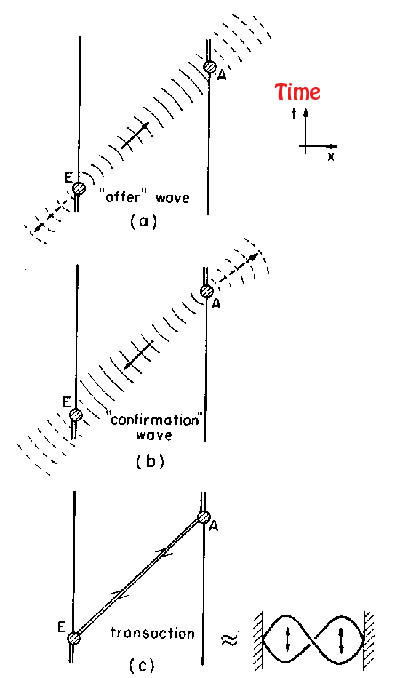 While the formulation shows an "exact canceling" of waves so no "net" energy travels backwards in time, it is still possible that this interpretation or a future modification will permit "communication with the future". This communication seems essential to be consistent with the observed precognition experiments conducted at the Stanford Research Institute and independently verified at Princeton University. A summary of these precognition studies is here. Hey, we recognize that this is complex stuff and don't feel like you need to understand the sketch in depth - it's not clear that anyone really does. Physics is struggling with the complexities of time, quantum mechanics and relativity theory. A book that puts this Transactional Interpretation (TI) into context is, Schrodinger's Kittens and the Search for Reality: Solving the Quantum Mysteries, by John Gribbin. Gribbin believes that the Transactional Interpretation "provides the best all-round picture of how the world works at the quantum level..."
To summarize the transaction model, the emitter produces a retarded Foward in Time offer wave (OW) which travels to the absorber, causing the absorber to produce an advanced Backward in Time confirmation wave (CW) which travels back down the track of the OW to the emitter. ... The exchange then cyclically repeats until the net exchange of energy and other conserved quantities satisfies the quantum boundary conditions of the system, at which point the transaction is complete. Of course the pseudo-time sequence of the above discussion is only a semantic convenience for describing the onset of the transaction. An observer would perceive only the completed transaction which he could reinterpret as the passage of a single retarded (i.e., positive energy) photon traveling at the speed of light from emitter to absorber. The emitter can be considered to produce an "offer" wave which travels to the absorber. The absorber then returns a "confirmation" wave to the emitter, and the transaction is completed with a "handshake" across spacetime. The TI interpretation of quantum mechanics seems the closest to being able to include the reality of precognition. Someday, we expect the evolving field of physics to find a way to include just that, i.e., a physics-based theory/interpretation that includes the reality of gathering some information from the future. Schrodinger's Kittens and the Search for Reality: Solving the Quantum Mysteries, by John Gribbin, 1995.